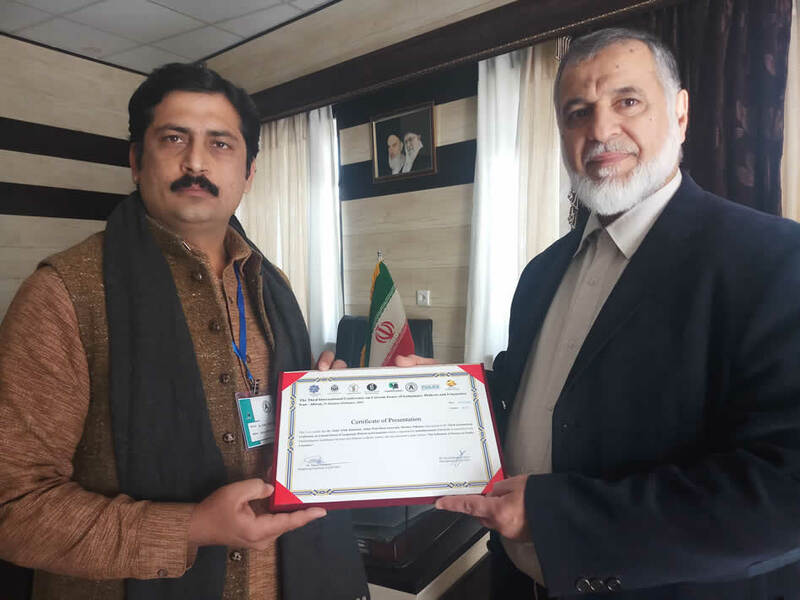 Dr. Syed Zafar Ullah Bakhshali Assistant Professor Department of Pashto Abdul Wali Khan University Mardan presented a research paper in International Conference Present a paper titled "The Influences of Persian on Pashto Literature” In the Third International Conference on Current Issue of Languages, Dialects and Linguistics Iran - Ahwaz, 31 January - 1 February 2019. The researcher presented the Pashtuns and Persian speakers have a common cultural background. Both Pashto and Persian are called sister languages. If Pashto has classical poets like Khushal Khan Khattak, Abdul Hamid, Abdur Rahman, Ali Khan, Persian has also great literary figures like Firdusi, Khayyam, Saadi and Hafiz. These Persian literary legends have influenced Pashtun poets and their literary works. Persian language has influenced different aspects of Pashto language and literature. Persian lexical influences are very much visible in Pashto language. Similarly Persian has influenced literary genres of Pashto like ghazal and Saqi Nama etc. Sufism has also been introduced in Pashto poetry through Persian poetry. Classical Pashto poet Khushal Khan has also praised Persian language and attributed it as sweet language. Though Arabic is regarded as a language of religion but Persian is regarded as a language of academia and teaching in Pashtun regions. Some classical Persian literary books have shaped the ethical development of the Muslims of sub-continent. In these books Bostān and Gulistān of Saadi are very popular among the folks. This article will elaborate various aspects of Pashto language and literature which have been influenced by Persian language and literature. At the end of conference certificate and was presented to researcher by the Vice Chancellor.